Our flagship product, Club Office is a 32-bit Windows accounting software system that is designed for private and semi-private facilities or organizations that utilize membership-oriented accounting systems. It can also be configured and extremely efficient in public and municipal environments. While it incorporates extensive billing flexibility to manage the complex multiple balances that clubs require for tracking minimums, prepaid programs and installments, it is just as at-home in a cash only environment. It also can manage one thousand "special interests" per member/customer account. Club Office can present member statements via the Internet if you wish, or you can email them in PDF format directly to your members automatically, too. 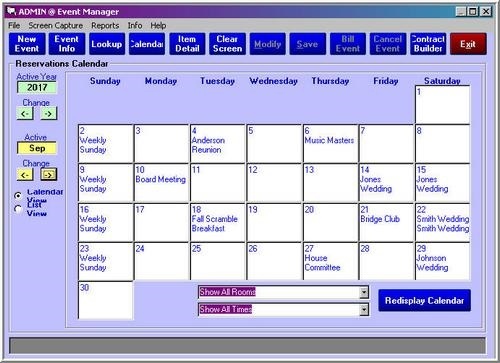 For up to 20 networked computers, Club Office is flexible, powerful club accounting software from a company that has stood behind its products for nearly fifty years. With the addition of SQLPos, our fully-integrated POS system, Club Office is the perfect back-office tool to merge your membership with your club's sales and accounting functions, eventually culminating in a positive bottom line when you run G/L operations. SQLPos is an "always-on" POS system: as long as you have electricity to power the register, SQLPos can service your customer sales -- even if the network or the server goes down. Fantastically flexible and configurable, up to 5000 sales buttons per register, lots of lookups, user-defined security, reports, and more. We even start you with a 10-register license so if you start with 2 or 3 registers, you can expand anytime you want without paying additional licensing fees or purchasing additional software. Lightning-fast Internet-based PCIand EMV-compliant credit card processing is built into SQLPos via our credit card processing partner, Mercury Payment Systems, so there's no additional credit card processing software to buy. Event Manager is a completely integrated catering and activity management system that can prepare quotes, generate contracts and event catering to-do lists, many reports, automatic billing, catering sales projections, calendars and more. Because it's integrated into inventory, membership and the accounts receivable system, using it to prepare personalized quick-quotes is a breeze. Enter the client information only once, use the contract builder to generate a contract by inserting the paragraphs you need, maintain a contact list, send out mailings or emails -- it's a true timesaver. Golf courses can finally own and control their own Internet tee sheet with HourGlass Reservations. Most online golf reservation systems require healthy setup charges, monthly or annual rental fees and often long term commitments. With HourGlass, you can host it on your own Internet web site or run it locally on an intranet if it's only accessible from within the clubhouse. It can be private or public, customers can register themselves if you allow them to, it can handle four golf courses simultaneously, and has many, many more options. What's more, it's incredibly affordable. Don't have a web site? We can host it on our server for you if you like, or we can point you to some fabulous and inexpensive web hosting packages. HourGlass can be purchased outright or, if you prefer, you can rent it from us as well. Either way, you may never find a less expensive yet very powerful tee time management system. For those who need an electronic employee time clock system, we offer TimeClock. The system can operate networked or even as a standalone application; it's also integrated into SQLPos's so employees can punch in/out right from a SQLPos register screen. Because it's integrated into the Club Office employee and payroll system, changes you make to employee records are immediately available to the TimeClock. Included reports augment the Club Office payroll system; employees can also print out their own punch in/out receipts and/or time and attendance reports for ranges of dates. A perfect application for a touch screen, but works equally as well with a mouse. SQLPos is our fully-integrated point of sale system. It's amazingly flexible and can be added to your existing Club Office system at any time. It's probably the single, most cost-effective way to increase your revenue using fewer labor hours. Whether you need one or ten registers, you pay one low price for our function-rich integrated POS software. Need more than ten? SQLPos can be expanded to up to twenty registers! Event Manager provides complete banquet/meeting event scheduling and administration functionality, including the ability to produce quotes, calendars, inventory and revenue projection forecasts and contracts. It's completely integrated into our inventory, membership and accounting system for direct billing. It's intuitive, easy to learn and easy to use. Our completely integrated employee timekeeping system. Incredibly easy to use, accurate, powerful, eliminates double-punches and employee cross-punches, eliminates most data entry when processing payroll. Can use employee magstripe cards for even greater security. Hosted on your own web site for total cost and security control. Finally you can ACTUALLY OWN your tee time reservation system instead of paying endless high rental and surcharge fees. Public or private system, integrates to Club Office membership. Can also be stand-alone and users can maintain their own address information. Full administrative control and overrides for all starting times. A working system is available for you to see both as a typical customer would and also as an administrator. To access the system as an administrator, please contact support@clubdata.com for the administrative ID and password. What does Club Office "look" like? HourGlass Reservations - Click to try it!